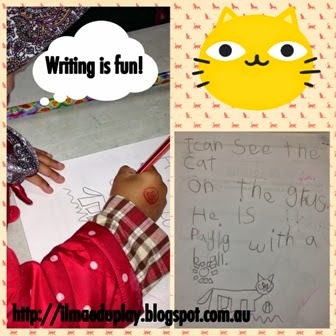 When children begin to write, they do so in simple sentences using the sight words they have learnt. Often it is a repetition of the same sentence with only a word replacement. For example, I can run. I can jog. I can eat. Or, I can see a cat. I can see a dog. And, I like to go to the park. I like to go to the beach. I like to go to the shops. 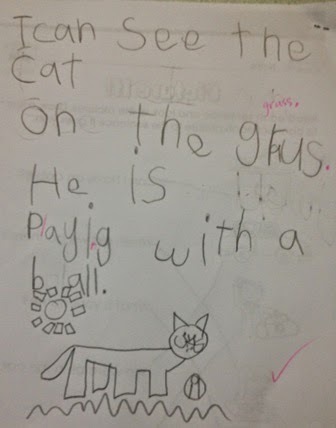 This is great writing practice for children as it is repetitive and uses words they have learnt. But to develop their writing further they need to expand on their sentences. To help them do this, you need to ask them where they can run to and where they see the cat. 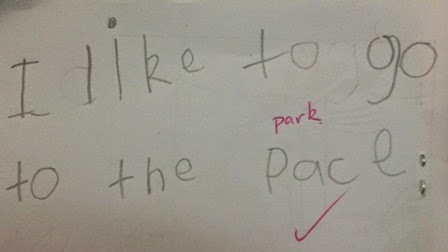 You could also ask when questions such as, when they see the cat or when they go to the park. The child who wrote the piece below started out writing, I can see a butterfly. When she finished writing that, I asked her where did she see the butterfly. Was it in the garden, on a flower or flying in the sky? After asking children where and when questions, you need to ask what questions. What is the cat doing? What will you be doing at the shops? You will notice that this is the beginning of a story - the orientation with who, where, when and what. The children who wrote these are in Prekindy. They will need plenty of practice writing like this before they can progress to writing about the problem and resolution of their story. Catch my next blog post where I will write about developing the problem and resolution of a story with Kindergartners and Year 1 students.